You use the picture varnish, or top varnish, to protect your oil painting. As opposed to the retouching varnish, which offers temporary protection, the picture varnish provides the definitive protection of your artwork. You can apply the picture varnish over the retouching varnish after one or two years. 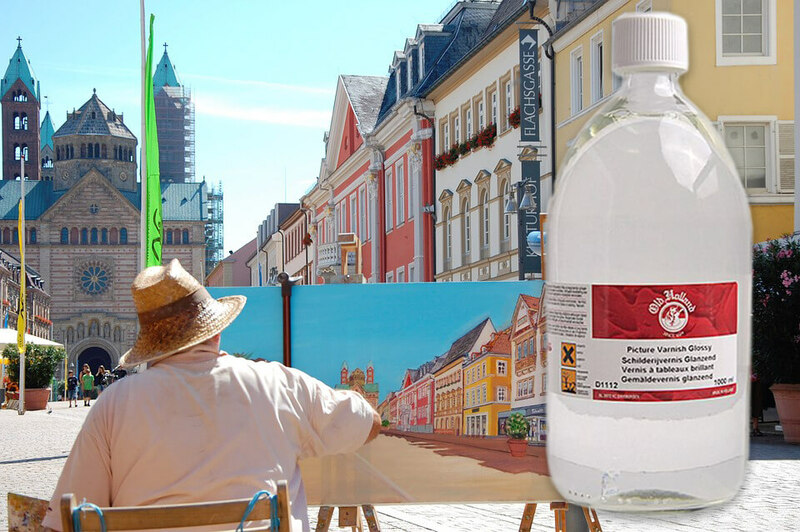 Does your painting consist of very thick layers of oil paint? Then the drying time will be longer, and you had better wait three years with varnishing. On an oil painting, the varnish deepens the colours, causing the matt areas to gloss again. You can choose between glossy and matt varnish. Do you want to achieve a semi-matt or semi-glossy effect when varnishing? Then you can mix glossy and matt varnish together. Or first apply glossy varnish, and matt in a week’s time. When making picture varnish, we use natural or synthetic resins, which we dissolve in volatile thinners. The picture varnish contains about twice as much resin as the retouching varnish. We add beeswax to the picture varnish, to make the varnish matt. The volatile thinners evaporate, leaving behind only the resin as a protective film on the work. Just as with the retouching varnish, you apply the picture varnish thinly, crosswise and in four directions. You must wait a week before applying a second layer of varnish over the first layer. View here our range of picture varnish.